Sometimes predicting the future isn’t all that hard. You don’t need a Gartner report to know that commerce is increasingly online, increasingly mobile, and a trend that shows no signs of abating. The question is not if the majority of your retail business will be digital, and specifically on mobile, but rather, a question of when. This is where we can easily draw the wrong conclusion from Mary Meeker’s outstanding Internet Trends reports, lulling us into a false sense of security. 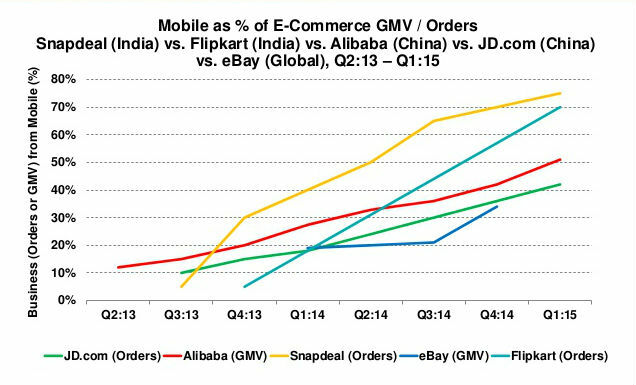 Mary Meeker’s chart above suggests an orderly, manageable progression of e-commerce. At an economy-wide level, this is accurate. For individual industries though, the impact of online is more like the impact of a pride of lions on a herd of zebra. The herd is culled gradually, but from the zebra’s point of view everything is fine until suddenly one day it’s not. Netflix was founded in 1997, gradually attracting new users each year. 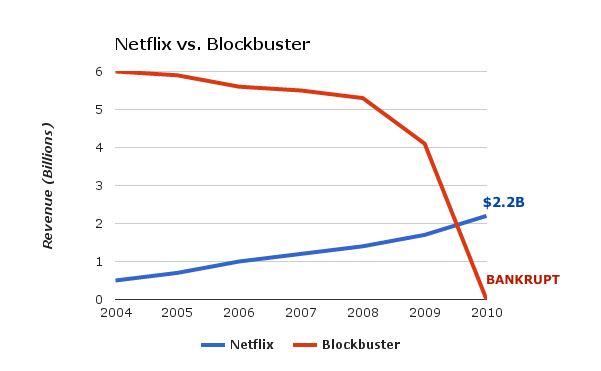 Blockbuster cornered the video market until 2005, when its revenue began to decline. It was clear that ordering movies in the mail was convenient and online video would be a thing, but to giant Blockbuster, small Netflix didn’t seem to be threat. In 2009, after four more years of modest decline, Blockbuster reported a larger than usual revenue drop. By October 2010, just two short years after reporting over $5 billion in revenue, Blockbuster was bankrupt. This isn’t an isolated story. Borders followed an almost identical course. And we can see it beginning to happen in new verticals. In 2012 Dollar Shave Club was just a funny video. This year it’s on track to claim 10% of the US razor market. This nonlinearity is what makes disruption so hard. Emerging technology seems niche in the beginning, because it is, but suddenly it hits a tipping point. By the time it becomes a clear and present threat, it’s too late to catch up. For online retailers, the shift that’s happening is mobile. 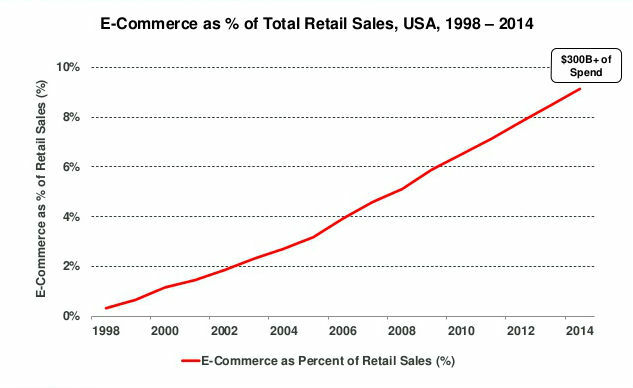 Right now, mobile commerce is still niche for many retailers. But, according to Flurry, use of shopping apps increased 174% last year. It’s not if the majority of consumers will switch from desktop to mobile purchasing, it’s when. The fundamental question is, when your customers switch, will it be with your business or a mobile-first (mobile-only) company like Spring, Lyst or Fancy? This is why every retailer, and especially online retailers, should be investing all they can in developing the best native mobile shopping experience they possibly can. Half-hearted “I have mobile too” efforts won’t work. Blockbuster had a DVD-by-mail service, Borders had a website. It didn’t save them. You need to go-all in, because all too soon mobile will BE your business. So how do you avoid becoming the next Blockbuster? We’ll cover that in our next post.  Archived in Best Practices and tagged 2015 Internet Trends, Blockbuster, ecommerce, Mary Meeker, mobile, Netflix, retail. Bookmark the permalink.